Chorizema cordatum is a brilliantly flowered small shrub. The Heart Leaf Flame Pea can be particular about soils, drainage, frequency of irrigation, and water quality. Chorizema cordatum grows in well drained gravely soils in its habitat in Western Australia. Poor drainage and excess fertilizer can doom Chorizema cordatum to an untimely demise. 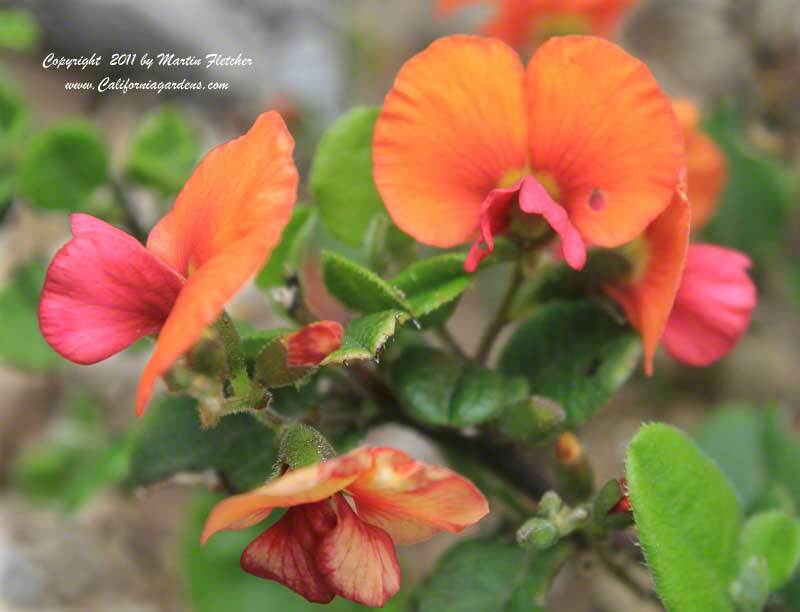 The Heart Leaf Flame Pea blooms from late Winter through the first half of Spring. Chorizema cordatum will bloom in full sun near the coast to moderate shade in inland gardens. Chorizema cordatum is Winter hardy into the mid 20°s F.
Flowers and foliage of Chorizema cordatum the Heart Leaf Flame Pea. High resolution photos are part of our garden image collection.